Serge Jupin is a French artist living and working in London. He creates kinetic sculptures using old domestic objects – often vintage findings and strange parts of old unwanted things around us. The artist gives a whole new lease of life to these objects. He is creating figures, which develop their own personalities. Their presence opens a dialogue between the viewer and his desire to play, to become a constructor and an inventor…. 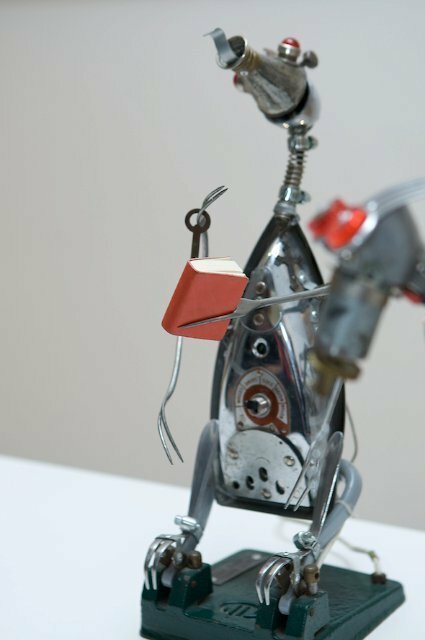 The little naive robotic sculptures provoke childish dreams to find a new meaning in old useless junk where humor and imagination play a major role. Mark Benson is a Scottish artist who currently lives and works in California. He is also looking into new meanings of ordinary domestic utensils, tools and objects, which we use as part of our daily routine. His prints, drawings, creations and inventions rediscover recognizable shapes. Then they are placed in a new context. He describes this process as a never-ending quest for technological advancement. He is fascinated with the observation of advanced design details found in these machines and devices. This allows him to create a process where his work arises from a close relationship between the artist’s ability to observe his vision and the mystic shape he is recreating.